Widely considered the most valuable baseball card of all-time, the T206 Honus Wagner has been the subject of great debate and, at times, controversy. Produced by the American Tobacco Company for its T206 series of baseball cards between 1909 and 1911, the Wagner has reached such mythical proportions that it is often simply called The Card. provides a detailed account of the origins of the T206 Honus Wagner baseball card, its rise to hobby prominence, and some of the less-than-noble events surrounding the card's provenance in the last several years. It is estimated that less than 60 of the T206 Honus Wagner cards still exist. By last count, there have been 57 known examples. Having produced anywhere between 60 and 200 in total, it is remarkable that this many of the cards have survived the test of time. Production of the card was cut short due to a dispute between Wagner and American Tobacco. The exact reason for this has become something of legend, but it has been widely accepted to be one of two scenarios. The first suggests that Wagner, a Hall of Fame shortstop for the Pittsburgh Pirates, didn’t want his likeness used to market tobacco. He didn't like the idea of how it might encourage kids to use tobacco. The second, and more probable, is that Wagner felt entitled to compensation from the American Tobacco Company for the use of his name and likeness to market their product. Regardless of the specific reason, what is known is that, unlike other cards in the set, the T206 Honus Wagner is disproportionately short-printed compared to other cards in the series. Despite being pulled from production, several variations of the card were printed. The majority of the cards seem to have been printed with a Sweet Caporal 150 Series-Factory 25 back. However, a handful are known to have the Sweet Caporal 150 Series-Factory 30 advertisement. Three are also known to have the Piedmont backing, making it the rarest version of all. Even the most beat up copies of the T206 Honus Wagner sell for at least six figures, just as long as it's deemed authentic. With a hobby so dependent on condition and rarity for determining value, it is remarkable that the Wagner gets such a pass on condition. Because of its rarity, history and the iconic Hall of Famer it depicts, the T206 Honus Wagner has been coveted, pursued, owned and sold by industry executives, Hollywood moguls, athletes and entertainers. Perhaps, the most famous is the Gretzky T206 Honus Wagner. The card long had a controversial past, as some speculate that it was once altered, most likely having been trimmed or cut from an undistributed sheet. This would account for its almost impossible-to-believe Near Mint condition. This controversy didn’t prevent the card from receiving a grade of 8 from PSA/DNA, the first card ever graded by the company in 1991. The Gretzky T206 Wagner was first sold by collector Alan Ray to the famed sports memorabilia dealer named Bill Mastro, the one-time owner of Mastro Auctions. In later years, Mastro Auctions was the subject of an FBI investigation for using unscrupulous methods such as card doctoring, price-fixing and shill bidding to increase profits. Mastro eventually sold the card to Jim Copeland, a sporting goods magnate, for nearly four times the price he had originally paid. The size and scope of the deal revitalized interest in the sports memorabilia market as investors saw it as a means of sheltering money in turbulent economic times, free from the volatility of the stock market and other traditional investment tools. In 1991, Copeland sold the card to legendary hockey Hall of Famer Wayne Gretzky and one-time owner of the Los Angeles Kings, Bruce McNall for $451,000, which again caught the attention of non-collectors and the mainstream press. Gretzky resold the card four years later to Walmart and a company called Treat Entertainment for $500,000. The card was used as the grand prize in a promotional contest. The next year, a Florida postal worker won the card and auctioned it at Christie's auction house for $640,000. The winning bid was placed by Chicago collector, Michael Gidwitz. As you can see, every time the card has sold, the value has risen significantly. The short amount of time it has remained in the hands of a single owner is indicative of the commodity status the card has achieved. Gidwitz sold the T206 Honus Wagner in 2000, through Robert Edward Auctions, to card collector Brian Siegel for a record-setting $1.27 million. In February, 2007, Siegel then sold the card privately to an anonymous collector for $2.35 million. It was later revealed that the anonymous collector was former major league pitcher Tom Candiotti. Just a short six months later, the card was sold to another anonymous collector for $2.8 million. In April, 2011, the identity of the buyer was revealed to be Ken Kendrick, managing general partner of the Arizona Diamondbacks. In October, 2013, controversy finally caught up with the Gretzky Wagner as Bill Mastro admitted to trimming the card. Click here to see a timeline of the sales history of the T206 Honus Wagner "Gretzky Wagner." A handful of other T206 Honus Wagner baseball cards have surfaced in recent years, some real and some not. Several of the authentic cards have fetched hundreds of thousands of dollars in auctions regardless of their condition. 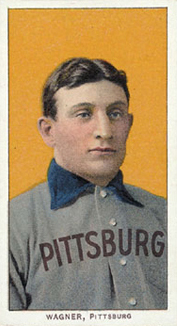 One particular T206 Honus Wagner of suspect provenance is the example owned by John Cobb and Ray Edwards of Cincinnati. The card attracted lots of media attention over its questionable authenticity, including being a feature segment on the highly rated sports documentary program, HBO Real Sports. Additionally, many leading hobby experts regarded the card as a fake, including PSA president, Joe Orlando. After years of refusing to have the card graded, the owners agreed to have the card examined by a fringe grading service, Card Collector Services, who also ruled that the card was simply a well-produced reprint. This didn’t thwart the owners' attempts to prove the legitimacy of their card, who next presented it to Integrated Paper Services (IPS), an independent paper testing and analysis lab to have their card's paper checked for era of production. An IPS expert determined that the card dated back to 1910, which would be consistent to the time period when the card was distributed. The expert ruled that the "paper stock was consistent with the time that card would have been made." With this proof as their claim to credibility, they proceeded to list the card on eBay but eventually had the listing removed due to the overwhelming number of questions the online auction marketplace received about the card’s authenticity. In 2010, the fabled T206 Honus Wagner card once again gained national notoriety when a new card was found. Belonging to the brother of Sister Virginia Muller, he left all his possessions to the Baltimore-based School Sisters of Notre Dame convent. Heritage Auctions handled the sale of the card, which exceeded pre-auction estimates. It sold for $262,000 despite being in poor condition. The publicity the latest T206 Honus Wagner received proved, once again, that regardless of condition, deep-pocketed collectors and investors are willing to pay huge amounts for this rare card. Only time will tell if other examples are waiting to be discovered. One thing is certain, whenever a T206 Honus Wagner is sold, it will make national headlines. T206 1909-11 PSA 5 Mordecai Brown Chicago Shirt-Piedmont 350-Centered and Sharp! David Thompson (ID 39461) � The best place to start would be to go to your nearest shop, at least to get a ballpark figure based on condition. Then, if a second dealer is an option, that’s a good way to compare. Otherwise, manually looking things up on eBay is also a good way to get a second opinion – just pay particular attention to condition, which is very important for vintage stuff. I am interested in selling my T206 Honus Wagner card. It is in excellent condition. What is my next step? Do you know how much it is worth? Linda (ID 58009) � Very nice. Your best bet is to have it graded and authenticated by PSA or BVG. From there, you’ll likely want to contact a major auction house. Thank you for your response. Is it really? I am new to this. How do I contact the PSA or BVG for authenticity? Linda (ID 58011) � Once proven authentic, the card is potentially worth A LOT. PSA’s website is psacard.com and their phone number is (800) 325-1121. I imagine they’d be very eager to grade your card. Best of luck and feel free to keep us posted. help!!! we have a honus wagner cars 350-460 with a gretzky signature at the top is it worth anything..
Do you guys have any information on the Honus Wagner card up that is up for auction now at Goldin Auctions? It’s called the Jumbo Wagner. Rosie � It sounds most definitely like a reprint if it has that story on the back. Authentic versions have a tobacco ad on the back. michael reardon � If you have a local card shop, start there. They should be able to tell pretty quick. Otherwise, checking out PSA (psadna.com) and having them check it out, although this costs money. I hve honus wagner card with his pic on front and wagner Pittsburgh at the bottom.on bck in red box honus wagner value 35’000.00 1910 tobacco card then small story…is it valuable or worthless. I have 100% real Honus Wagner card. I got extremely lucky. My dad just found the same card and it doesn’t have any markings and/or words that signify that it’s a reprint. He cannot remember how long he’s had it or where/when it was purchased or found. I guess the next step is to take it to a local baseball card place. Then who knows. How much does using PSA cost? Thanks for any information. Kindest regards. How much is a mint remake worth? Lol I find it highly strange that 10 of the 50 something Wagner 206 owners have commented on this article. I think some of y’all are telling fables.. Guaranteed not one of them is authentic. LOL thats what I was thinking. I thought I was Lucky to own 3 52 Mantles. LOL! My sentiments exactly gentlemen..Very very unkikely if not a guarantee that not a single card of the 10 mentioned here are authentic. David you are very lucky to have 3 – 52′ Mantles. I’m sure it took more than “300” hours to find those lol!